These Lamb Muffin Pies are delicious and quick and easy to put on the table using your leftover roast Lamb! Pre heat oven to 180 degrees. Grease muffin tins with butter. Heat fry pan and add bacon, lightly fry (no oil needed) until just browned and remove from heat. Place gravox in saucepan and slowly add water, whisk until smooth. Heat saucepan and continue to whisk until thickens, add Worcestershire sauce. Add lamb and bacon into gravy and stir through. Cut circles out of puff pastry using cookie cutter or large glass. 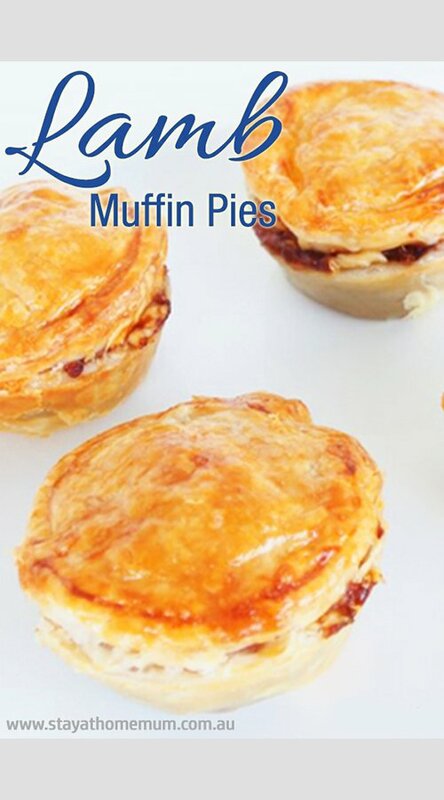 Press pastry circles into greased muffin tin, then add 1 heaped tablespoon of meat and gravy, top with 2 teaspoons of grated cheese. Place pastry lid on and brush with egg. Bake in oven for 25 minutes until golden brown. Lamb Muffin Pies are suitable for freezing for up to 6 months or keep refrigerated for up to 3 days in an airtight container.